Mix 1-10 oz can of unsweetened crushed pineapple (drained) with 2 tbsp of dark brown sugar. 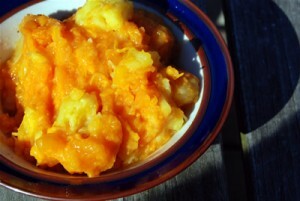 Combine with a 40 oz can of unsweetened sweet potatoes (yams) and put in a slow cooker coated with cooking spray. Cook4 hours on low.